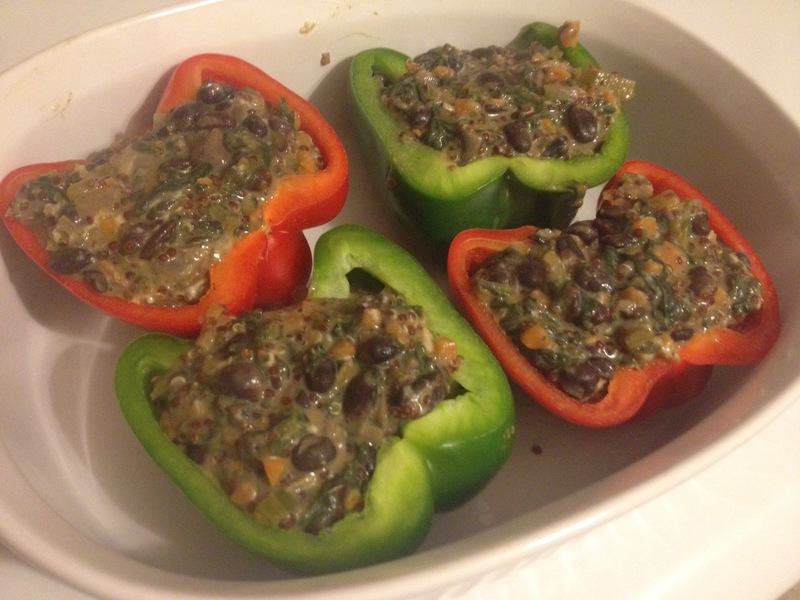 Colorful and also freaking yummy cheesy quinoa and black bean stuffed peppers. Because I like you guys, I’ll be honest. I’ve made quinoa stuffed peppers before, and they’ve rated a solid “meh” on the flavor scale. But these little guys? On top of being super easy to make, they’re cheesy, they’ve got a little kick, and they will put a smile on your face. And if (for some unforeseeable reason) they fail to accomplish that last bit, try this. When I first made these, I had a few cups of the extremely filling filling leftover. What was I to do? Well, piggy enterprising as I am, I figured the filling would make a good dip, and grabbed a handful of tortilla chips to get my appetizer on, fooling myself into thinking I could eat just a few bites and save the rest. Of course, I ended up scarfing down all of it, and wasn’t even hungry for the peppers when they emerged from the oven. No worries, they fed me for the next week, aaaaand I found my new favorite dip recipe, in addition to my new favorite stuffed pepper recipe. And hopefully yours. That same night, I also ended up spilling an entire glass of wine and a can of black beans on the floor and nearly severing a toe when I lost my grip on my veggie-dicing knife…but that’s another (cautionary) tale of trying to cook whilst clumsy. Anyway, I believe the credit for how fabulously scrumptious these peppers are goes to the addition of Daiya mozzarella cheese in the stuffing. And maybe the cayenne pepper should get a little nod. But you be the final judge. Cut your peppers in half, and pull out the seeds and ribbing (the light-colored stuff). Heat the olive oil in a saucepan over medium heat. Add the onion and celery, and cook 5 minutes, or until soft. Add the mushrooms, cumin and garlic, and sauté the mix for another 2 minutes. Break up your frozen spinach as well as you can (I achieve this by slamming the bag against my kitchen counter like a psychopath), and toss that in the pot. Cook for another 5 minutes, or until most of the liquid is evaporated. Add in your black beans, quinoa, carrots, and about 2 cups vegetable broth (enough to cover the whole mixture). Cover the pot and bring your mixture to a boil. Then reduce the heat to medium-low, and simmer 20 minutes. My favorite step: Stir in the vegan cheese. Add in your salt, black pepper and cayenne pepper. Stick your face as close to the mixture as is safe and take a giant whiff. Yummmmm. Spoon a heaping helping of filling into each pepper half, and carefully place them in a casserole or baking dish. Pour about a half cup vegetable broth into the dish, then cover with foil and bake for 1 hour. Sprinkle each pepper with more cheese, if you like, and then bake uncovered for about 15 minutes more, or until the tops are browned. In addition to the fact that they taste like joy, another lovely character trait of these peppers is that they keep really well. If you plan to scarf them down in the next few days, just pop them in a fridge-suitable storage container and, when it comes time to nosh, wrap them in tin foil and bake them in the oven at 350 for 20ish minutes. Or, if you want to make a bunch for a rainy day, place each pepper in individual freezer bags (make sure you get as much air out as possible) and they’ll keep in your ice box for months. Just defrost in the fridge before cooking, and give it the same tin foil and baking treatment.